Summer is coming. are you ready to start your own mall food business? The most popular thing at the moment is cold drinks, bubble tea, ice cream kiosk, and the smoothie service. What I want to share in this article is some very typical success ice cream kiosk project. If you want to start your own ice cream shop, it’s worth following me through the details below. At first, I would like to introduce a very popular ice cream cabinet in Australia, the whole shop using Low-key white as the main tone. match black Corian worktop. very exquisite and modern. The whole shop is a square shape,4m length by 4m width, the front part of this kiosk is the main sale area. in the middle is a high display stand with lightbox menu list. the customer can direct choose and order here. the left side of this kiosk is work area. here have three fried ice cream machine, white frosted glass baffle. it’s very nice can prevent customer direct see the whole kiosk inside. the back side of this kiosk is some stainless steel sink, it’s easy to clean. The second style is very popular in the United stated GGP mall, we have done two sets and export to Miami last year, the main tone is white and purple. the surface also with many wood grain strip decoration. the cashier counter on the left corner. the front part is a double panel fried ice cream machine. with some stainless steel topping container and glass cover. the back sides with a big beverage display fridge. you will find here have a three-hole stainless steel sink. almost all mall in the USA asks this. 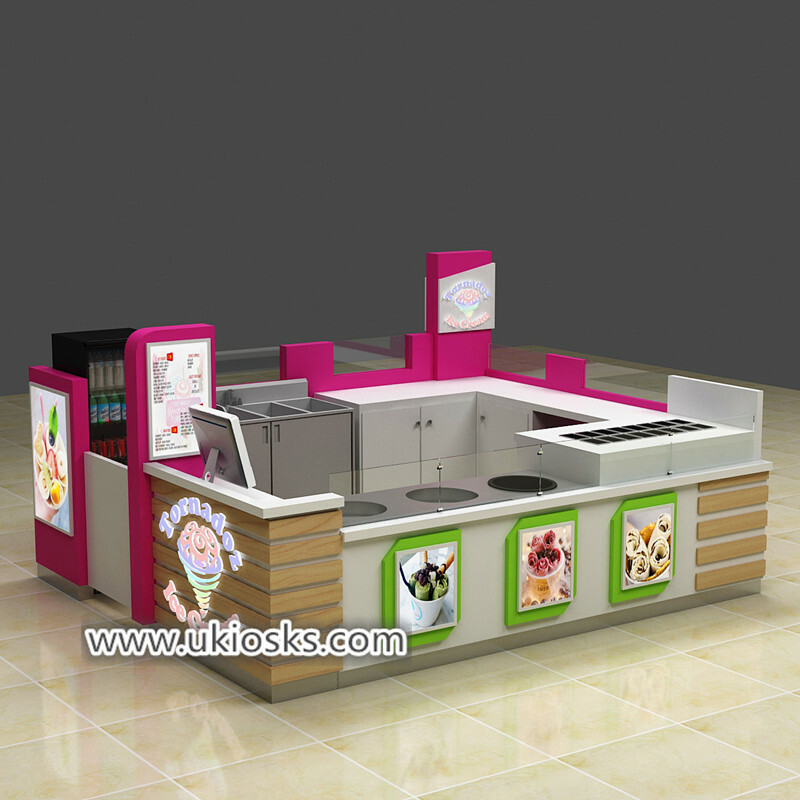 What Points you will notice to build an ice cream kiosk in a mall? Style 1: fire retardant MDF with 2PAC painting. 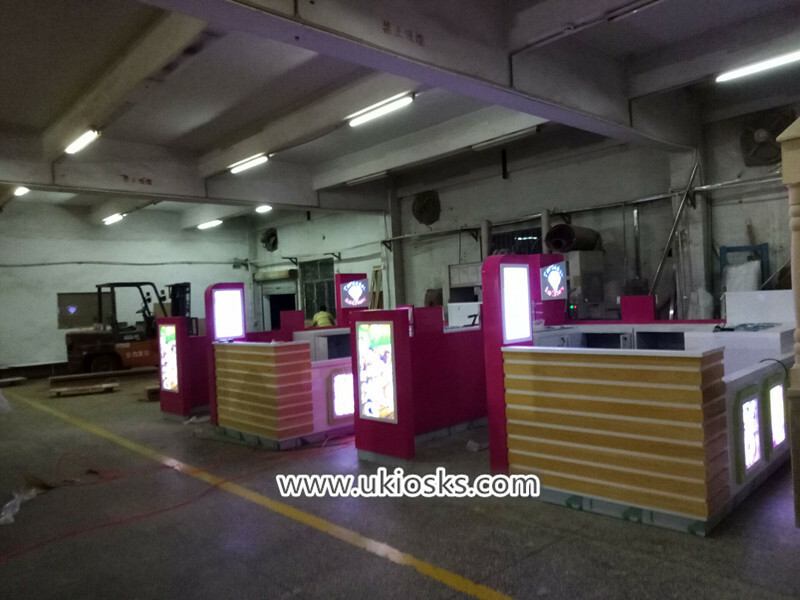 almost mall kiosk will choose MDF as the main material. surface use baking painting finished. it’s easy to build any special shape. very glossy and a smoothie. Style 2: E1 plywood with fireproof plate finished also is a good choice. the match Corian worktop.is very nice for waterproof. 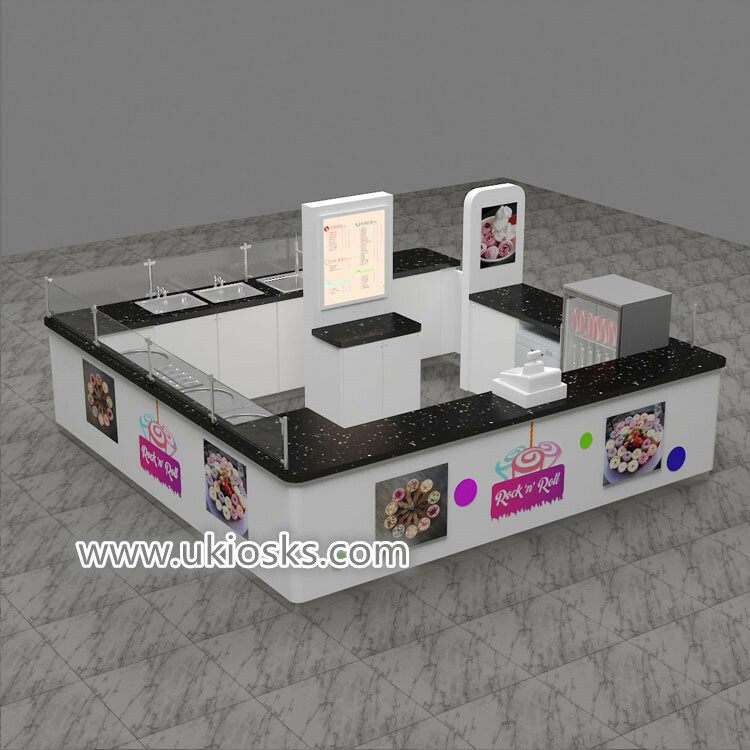 Color: Almost mall fried ice cream kiosk will choose a bright color as the main tone. of course, white, gray, and wood grain also is a good option. anyway, it’s better to make the whole kiosk match your Floor and ceiling throughout the store. This will look very harmonious and attractive. Layout: you will notice almost mall kiosk will choose a front part for order and showing, back sides for put some big machine. under counter, we will make some cabinet for storage. besides, did you find the kiosk is on the corner or backside? is in small size, is about 500-600mm width. You can reserve more space for display or storage. The unique kiosk as a direct manufacturer, we are dedicated to designing and customize different food kiosk in the mall. if you’re interested to start your own food business like this one, pls direct contact us, welcome inquiry. thank you!